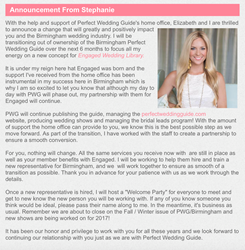 On September 13, 2016, former owner of Perfect Wedding Guide Birmingham, Stephanie Whitaker released a statement informing the company and wedding vendors of her departure from Perfect Wedding Guide. In the announcement she stated that she would be turning ownership over the the corporate offices of Perfect Wedding Guide. For more information about the future of Perfect Wedding Guide Birmingham, you can contact Debi VanderVoodt at 866.314.9108. You can also find attached to this press release the announcement made by Stephanie Whitaker. For over 25 years, Perfect Wedding Guide has been dedicated to creating innovative wedding planning solutions for brides of all budgets. Our company offers couples fun, useful, and FREE products to help make wedding planning less of a chore and more of a treat. Our local guides and bridal shows are available coast-to-coast in over 20 markets, showcasing some of country¹s top wedding vendors who work right in the bride¹s backyard. Our national website, PerfectWeddingGuide.com, is full of fresh planning tips and wedding ideas, wedding news, an extensive photo gallery for inspiration, easy-to-use wedding planning tools, as well as a wedding blog community hosted by our national wedding planning expert.